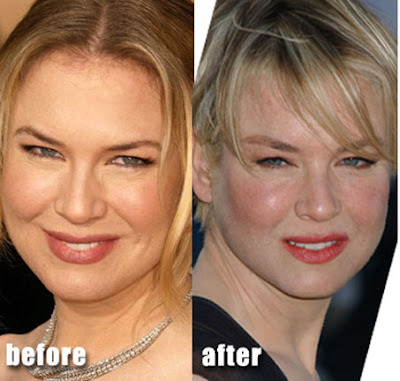 Renee Zellweger before and after plastic surgery? It seems as if many websites have sparked rumors about Renee Zellweger getting plastic surgery, claiming botox injections and facial fillers among other procedures. More often than not its an open and shut case when it comes to celebrity plastic surgery, however with Renee Zellweger I'm not too certain about her alleged plastic surgery procedures. Maybe she had a small amount of botox, but definitely noting more than that...At least on her face, that is. Checkout these before and after photo and let me know if you spot any signs of plastic surgery. Why would she do something like this to herself?? I would assume she could afford the best possible and yet it looks horrible. Please do not do anything further. Aside from hair color and make up she looks 100% natural in both photos. To presume that she drinks because she has a certain eye shape is ludicrous. It is difficult to make conclusions from pictures like these because people change as they age, she is obviously more "done up" in the left picture and the lighting is harsher on the right. Other than that, she looks fine.